Live Aid, Band Aid, USA for Africa: Did pop stars and hit songs help Ethiopia famine victims? 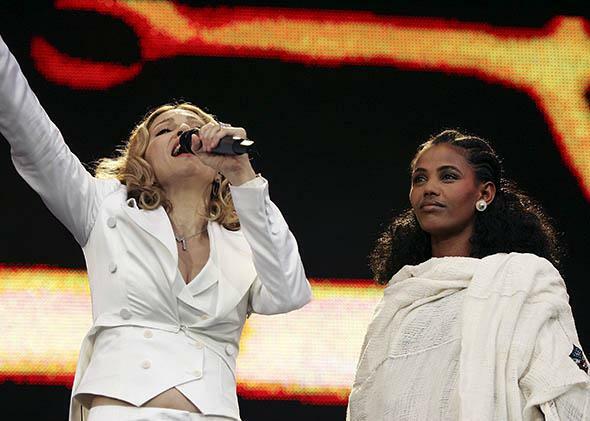 Madonna performs onstage next to 24-year-old student Birhan Woldu, former Ethiopian famine victim and the inspiration for Live Aid 1985, at Live 8 on July 2, 2005, in London. 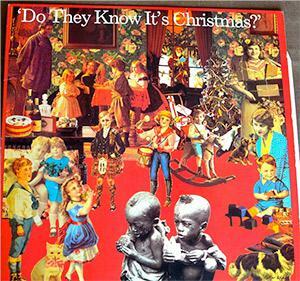 The cover art of “Do They Know It’s Christmas?” showed emaciated African children tormented by flies against a backdrop of photos of white children celebrating Christmas. The album producers were surprisingly unaware that a majority of Ethiopians are Orthodox Christians who do very much know when it’s Christmas. More seriously, the degrading picture of the children perpetrates a common stereotype of Africans that is both inaccurate and insulting. While famine is an enormous tragedy for its victims, it is thankfully far from a common occurrence—in any given year, about 1 of every 345 Africans is affected by famine. Insulting stereotypes of Africans are at the heart of why celebrity famine relief gets the whole problem so badly wrong, not only in 1984 but still today. The celebrities promote a worldview in which “they,” Africans, are unable to help themselves in preventing famine, and so passively await rescue from “we” Western famine experts, a category that apparently includes rock stars. The big question is: Why are Africans so unable to help themselves? The old view that Africans were just racially inferior is thankfully no longer acceptable, but there seems to still be plenty of less explicit condescension toward Africans behind the whole enterprise. There is an alternative view, that famine in Africa tends to happen in places where the victims are oppressed by local dictators. As Amartya Sen famously pointed out, democracies don’t have famines. If autocracy is the problem, the insulting stereotypes perpetrated by celebrities make the problem worse rather than better. These stereotypes make it harder to recognize how much Africans deserve (and are already fighting for) greater political and economic rights to actively determine their own destinies. Why does autocracy sometimes lead to famine? The most fundamental reason is that autocrats often don’t care enough about the population to prevent famine. Autocrats maintain power through coercion and repression, not popular approval. Democratic rulers are forced to care about the population because the populace protests and/or votes to drive them out of office if they cause or allow disasters like famine to happen. In the United States, one of our elected officials suffered enormous political damage from something far more trivial than a famine: just a traffic jam on a bridge! The 1983–85 Ethiopian famine that was the subject of celebrity efforts occurred under the military dictatorship of Mengistu Haile Mariam, which was about as far as you can get from multiparty democracy and a free press. Ethiopia’s autocrats oversaw recurrent famine. An African contrast with Ethiopia was Botswana. Botswana, like Ethiopia, is prone to drought but has been a democracy since independence in 1966. Independent Botswana has never had a famine. Botswana’s democratic government explicitly deploys relief efforts during every drought, and even improves them from one drought to the next. Have celebrity famine fighters gotten any better since the 1980s? Another outburst of celebrity rock stars singing against African misery occurred on July 2, 2005, with the Live 8 concert, aimed at convincing the Group of Eight (the eight leading developed powers), which was meeting in the United Kingdom at the same time, to increase foreign aid to Africa, to combat famine and hunger in Africa, as well as to address other afflictions of the poor. It included some of the same rock stars as Live Aid, headlining again Bono and Paul McCartney. The Live 8 poster once again embraces the degrading stereotype of an emaciated African child. Attending the G8 summit to represent East Africa on the celebrity-promoted African aid program was Meles Zenawi, the prime minister of Ethiopia. Meles was fresh from highly disputed elections in May 2005 in Ethiopia that extended his time in power, which had begun in 1991 when his forces had overthrown the previous dictator, Mengistu. Meles would later that year deploy his security forces to shoot down protesters against the rigged elections in the streets of Addis Ababa, as well as jailing opposition figures. The awareness of Ethiopia’s unbroken succession of autocrats as a persistent cause of poverty and hunger did not make it into Live 8 concert speeches. If only they had consulted the Who: Meet the new boss, same as the old boss. Bono appeared together with Meles at a May 18, 2012, conference on food security in Africa on the eve of the 2012 G-8 summit. Meles’ credentials as the answer to famine in Ethiopia continued to be in doubt. In 2010 Meles had been caught red-handed by Human Rights Watch manipulating food relief financed by foreign aid to go only to members of his ruling party, literally starving the opposition of support. Donors at first promised HRW they would investigate, then quietly dropped the investigation a few months later. Ethiopia under Meles also fell a bit short of allowing the free press beloved by Sen as a famine preventer. Meles’ government had convicted the peaceful dissenting blogger Eskinder Nega of “terrorism” on Jan. 23, 2012. Eskinder is now serving out a prison term of 18 years. Celebrity rock star protests of these events have not been conspicuous. The attitude toward poor people as passive and helpless, partly fueled by celebrity relief stereotypes, does not make a fertile environment for protesting even those African rights violations directly financed by Western donors. It is not a fertile environment for supporting the many Ethiopian dissidents in prison or in exile fighting for democracy. Aid continues to support the autocratic oppressors in Ethiopia instead of the oppressed. Similar situations exist in other African autocracies. The awareness of the autocratic roots of famine has never arrived in the celebrity aid community, one of the loudest voices in the room on African development. This is not good news for preventing the next famines in Ethiopia or in other autocratic countries in drought-prone Africa, or for the general cause of democratic rights for Africa equal to those in the United States or United Kingdom. The original “We” in “We Are the World” and “Do They Know It’s Christmas?” did not include “They” Africans. How about including Africans in the “we” of another, much better song suggestion? When we let freedom ring, we will be able to speed up that day when all of God’s children, black men and white men, will be able to join hands and sing: Free at last, free at last, Thank God Almighty, we are free at last.